Here we are - at the beginning of summer. A time when our minds often drift to trips, outdoor activities and family barbeques. Keeping the momentum in projects can seem a bit more challenging during the summer months with team members in and out of the office on vacation. Sometimes, a little help is all that's needed to keep projects moving in the right direction. The Center offers several practical ways to keep your team and projects moving forward. Do you need research direction or a bit of project management? Our research services team can provide you with research expertise - timely healthcare industry research advice that will help advance your healthcare facilities projects. Whether you need expert advice on a research project, need an expert to do research for you, or you simply need to be pointed to the right resources, we can help you. Find more information about research services here. Or utlize our on-demand webinars as "lunch and learn" occasions - with a chance for all on the team to earn AIA/EDAC CEUs. With over 70 webinars to choose from, you can easily find a topic that addresses the challenges facing the team today. Do you prefer live presentations? Our knowledgeable staff and board members are available to provide educational consulting. Our experts can present and lead discussions on a variety of topics. You can easily stay up-to-date with all the learning opportunities we offer, both in-person and online, that include workshops, Health Design Insights Networking events, live and on-demand webinars and EBD Journal Clubs by viewing our website calendar. EBD Journal Club "An Empirical Examination of the Impacts of Decentralized Nursing Unit Design"
Member Project: "Children's Hospital Central California - Paramount Farms Plaza Expansion"
Executive Summary: "Universal Design: Designing for Human Needs"
Interview: "Incorporating Social Connectivity into the Built Environment to Accommodate Aging Populations"
As always, let me know what tools and resources are helpful to you, and we'll feature them in our future newsletters. In today’s healthcare environment of dwindling reimbursements, increased volumes and higher demand for patient satisfaction, there is a push to optimize space and leverage technology to work as effectively as possible. To make the best use of space and resources, healthcare leaders are looking to right-sized patient smart rooms to optimize efficiency. These highly designed smaller spaces accommodate the patient and family just as larger rooms would while meeting the Facility Guidelines Institute requirements. Technology enables providers to deliver care more efficiently and creates environments that are interactive and informational for patients. The result? A patient room that maximizes available space, lowers construction and operational costs, improves process flows for providers and improves patient and family satisfaction. Patients with complex mental health issues frequently end up in the emergency department, where they may wait hours or even days for a psychiatric bed. This is especially true of patients who have a “dual diagnosis,” or have both a mental health disorder and a substance abuse problem. Judith Shindul-Rothschild, an associate professor of nursing at Boston College who has published research on ER wait times, said that a shrinking number of psychiatric beds is especially impacting children and adolescents. The scenario plays out "over and over and over again," she said. * What role can the built environment play in solving the growing mental health and substance abuse crises? Join today's top experts on September 26, 2017 in Arlington, VA, at our next Pebble in Practice Workshop - "Behavioral Health—Strategic Facility Design Innovations that Improve Treatment Outcomes, Safety and the Bottom Line" More information here. The past decade has seen dramatic shifts in the way wellness services are provided to older adults. Outdated senior living communities are repositioning themselves to stay competitive, and many of them are revamping their wellness programs to align with contemporary views on holistic, person-centered care. Many newer wellness programs are updating programming and facilities to serve the senior living industry, but plenty of room still exists in the marketplace for innovation, and there is a unique opportunity to grow beyond the senior living niche market. McKnight's Senior Living, more . . . While the healthcare system in America is in a state of crisis, the hospitals, care centers and research facilities that make up the industry -- in the States and abroad -- have never looked better. Gone are the days of sterile spaces, shared rooms and buildings that could be confused for corporate offices. Instead, we've seen a new class of hospitals that are more like hotels, with private rooms, gardens and art installations. But competition is driving people away from private facilities and into county hospitals that are adopting a new, more patient-centric approach, according to Pat Bosch, design director at the Miami office of architecture firm Perkins + Will. "We're seeing a lot of intersections with corporate America, retail, hospitality and civic [architecture]," she says. "It's about: How do you attract and retain your community and your patients? How do you attract and retain doctors and nurses?" CNN, more . . .
What role can the built environment play in solving the growing mental health and substance abuse crises? What impact do your design decisions have? Are you making use of the best and latest design solutions? Design is making a difference in the lives of children and adults faced with these conditions, in the safety of the staff who treat and care for them, and in the financial and legal challenges faced by providers. Join us for this one day interactive, collaborative, problem-solving workshop intended to enable design and healthcare facility professionals to employ physical design strategies and methodologies that support improved care for behavioral health. This unique experience is ideal for individuals who are intending to design new mental and behavioral health facilities and those wishing to evaluate the quality of their existing facilities. Get the Early Bird Rate! Knowing when and how to integrate evidence-based design (EBD) into the design process can be a challenge. This webinar will provide practical tips for searching for, evaluating, and using evidence in the design process. The speakers will discuss how to use the evidence in design decisions, how to measure the effect of your design on outcomes, and how to share your projects’ findings as evidence for others to use in EBD. Enjoy this free resource here. The Healthcare Environment Awards honor healthcare interior architecture and design across a range of project types. Co-sponsored by Contract magazine and The Center for Health Design, in cooperation with the Healthcare Design Expo & Conference, the Healthcare Environment Awards are published in the November issue of Contract magazine. Free resources and tools to advance best practices and demonstrate the value of design to improve health outcomes, patient experience of care, and provider/staff satisfaction and performance. Need CEUs? Our on-demand webinars provide the latest trends, tools, and resources for improving healthcare environments. Earn one AIA/EDAC CEU. The EDAC Advocate brochure is published annually and highlights EDAC Advocate firm projects that illustrate how evidence-based design was applied to address challenges in their projects. 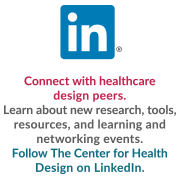 The Center for Health Design is a nonprofit 501c(3) organization whose mission is to transform healthcare environments for a healthier, safer world through design research, education and advocacy. Looking for ways to support our work? Contact us.